Now, this is really interesting, not so much for the items but in the way they are presented. Here the list has be segmented into little boxes with what looks like similar items in each box. Does this represent a map of the supermarket aisles or is this how the food is stored at home? Fridge items in one box, household in another etc. 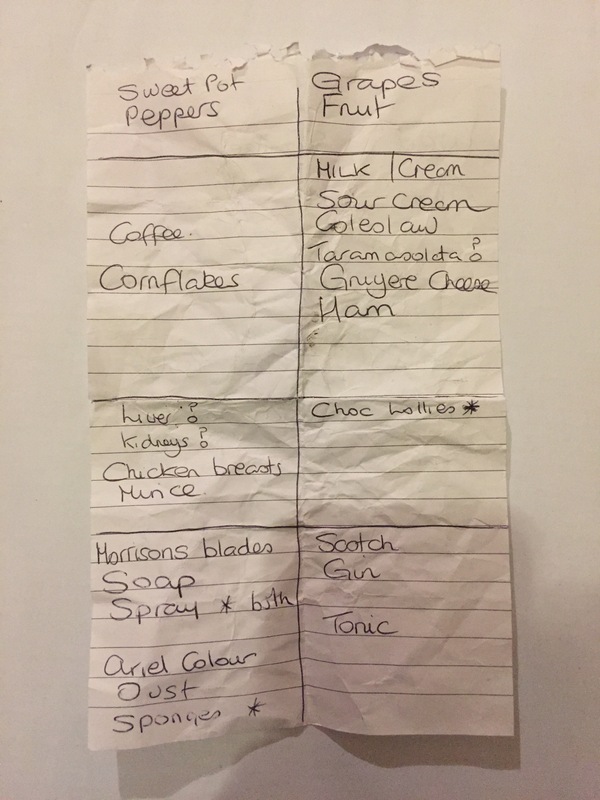 Sweet pot, peppers, coffee, cornflakes, liver, kidneys, chicken breasts, mince, morrison’s blades, soap, spray * bath, ariel colour, oust, sponges, grapes fruit, milk | cream, sour cream, coleslaw, taramasalata?, gruyere cheese, ham, choc lollies, scotch, gin, tonic. I do my lists this way as well. I picture the supermarket we are going to (mostly one of the three nearests ones) and write my list accordingly 🙂 Saves time and much running around the supermarket! I agree with our introverted one, this person knows the layout of the supermarket and is an organised soul. I’ll bet the fridge and pantry in that house are neat as pins. I think it is mostly that they are grouping similar items together and that follows that they will be in similar places in the supermarket. Veg, fruit, breakfast items, dairy items, meats, sweets, household and alcohol. I find it interesting that this one mentions grapes separately and then fruit. Why do grapes get singled out? !